Since 1981 long distance rail travel in France has become dominated by TGY services using dedicated high speed track or operating over conventional railways. Despite the advances made by high speed rail, there remain a few mainline services where traditional passenger rolling stock is hauled by diesel or electric locomotives and the former Paris Orleans Railway route from Paris to Toulouse is a good example. Photo - SNCF Class 26000 B-B no.26021 waits departure from Paris Austerlitz with the 1352 Teoz service to Toulouse. 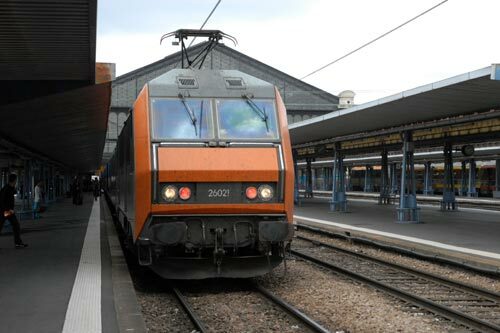 Operated under the French Railways long distance passenger brand "Teoz" the route south from Paris Austerlitz station to Toulouse provides regular intercity services for the intermediate stations of Vierzon, Limoges, Brive-la-Gaillarde and Cahors. Most trains do not make the full journey from Paris to Toulouse but instead terminate at the intermediate stations. However there remain through services throughout the day and the route provides an opportunity to sample French intercity rail travel as it used to be. The start is Paris Austerlitz station which is currently under redevelopment. Less important since the transfer of its Bordeaux services to Montparnasse station, Austerlitz nevertheless still caters for considerable traffic most of which remain locomotive hauled. Departure for this journey was on time at 1352 and the class 26000 B-B electric soon accelerated through the Paris suburbs with glimpses of the River Seine to the left. It is hard not to be impressed by the way French loco-drivers maintain maximum line speed with brake applications very rare. The train is heading for Orleans, which rather surprisingly is omitted from the list of station stops, and as this cathedral city gets nearer you will see a concrete structure running parallel to the railway on the left. This is the remains of the 18 km test track that was built to test Aérotrain prototype I80, stretching between Saran and Ruan. Speeds of up to 400 km/h were anticipated and testing was undertaken although the project was eventually abandoned. The train slows past the extensive marshalling yards at Orleans and forks left for Limoges. The scenery as far as Limoges is mostly uninspiring although Orleans Cathedral on the right is worth seeing as is the crossing of the River Loire. The first stop is Vierzon followed by Chateauroux where the River Indre is crossed. Sadly nothing is seen of the interesting old town. As Limoges gets closer so the scenery improves with the line curving through the undulating countryside. Again the skill of the loco driver is evident as maximum speed is maintained with very few brake applications. Limoges is a fine city and home to one of the most beautiful railway stations in the world - opened in 1929 Benédictins station has a wonderful dome and a tall clock tower that can be seen throughout the city. The dome suffered fire damage in 1998 but has since been restored to its former glory. Heading south from Limoges the scenery improves and the section through to Brive includes a varied mix of rolling country dotted with villages. Leaving Brive woodland begins to dominate and the train slows as tighter curvature demands more cautious speeds. A series of tunnels each with its date of construction precedes arrival at Souillac which is approached over a wonderful curved viaduct above the town. Continuing Cahors is next stop before a final run down into Toulouse and Gare de Matabiau with an arrival a minute or two early.